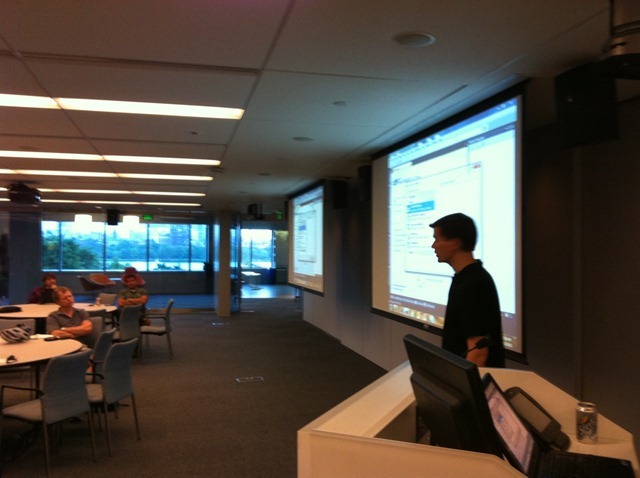 Many thanks to Chris Bowen who was the guest speaker at the August 2010 Boston Azure user group meeting. The topic was ASP.NET MVC, with an Azure perspective. There was no slide deck – Chris jumped right into the code. Here are a few of my rough notes. Consider Web Platform Installer 2.0 to install Azure tooling. ASP.NET MVC is closer to the metal than traditional ASP.NET – if you want to implement, say, XHTML, then nothing stands in your way. Strongly-typed Controllers and Views can be generated once your model is in place. Ctrl-Shift-Click on Visual Studio in Win 7 will launch in Admin mode which Azure requires. Can modify the T4 template for MVC to alter its UI options in wizards. New in ASP.NET 4 (not just ASP.NET MVC 2) is <%: “foo” %> where the “:” is a new feature as shortcut for HTML.Encode for the content. MVC 2 has powerful client-side validation based on characteristics of your model. Does not require a server-side round trip. You specify e.g., [Required] attribute on Model data – and you don’t need to write any imperative code. http://asp.net/mvc – many great resources. Windows Azure developer fabric – also known as “the fog” – is the Azure cloud simulator running locally. Also check out by Arra Derderian’s write-up of the same Boston Azure meeting. There were around 30 people in attendance at the meeting. This entry was posted in Programming on August 31, 2010 by Bill Wilder.